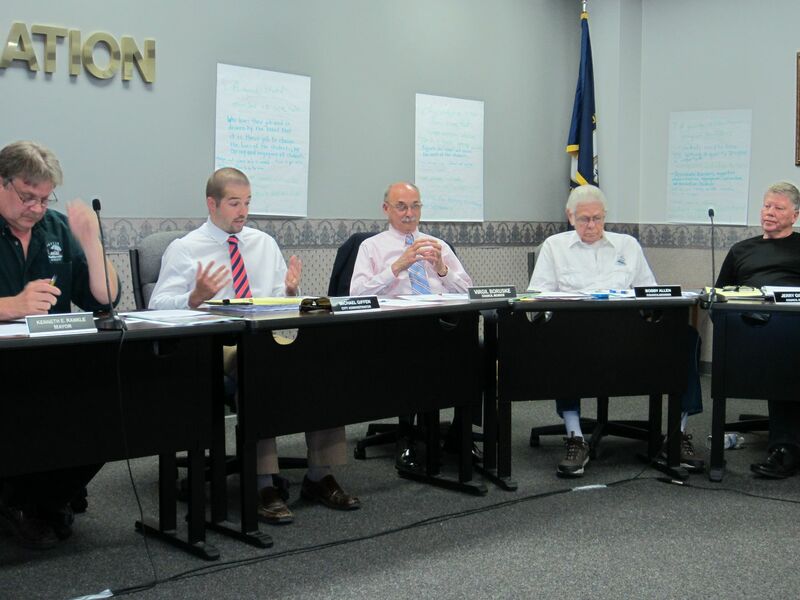 In a reversal of its decision made in early March, the Dayton City Council voted on Tuesday to cancel its plans to hold regular meetings at the Board of Education building as it did last night. "Anything to create chaos," Mayor Ken Rankle said to some members of the city council after the 4-2 decision. The council voted in March after Rankle broke a 3-3 tie to move its meetings from the City Building on Sixth Avenue to the larger Board of Education building to accommodate the growing number of residents that had been attending. "We voted to have it down here for consistency. This is a room obviously filled, it's full of people and big enough to hold everybody so they can stay informed and they don't have to guess which way to go," Rankle said. 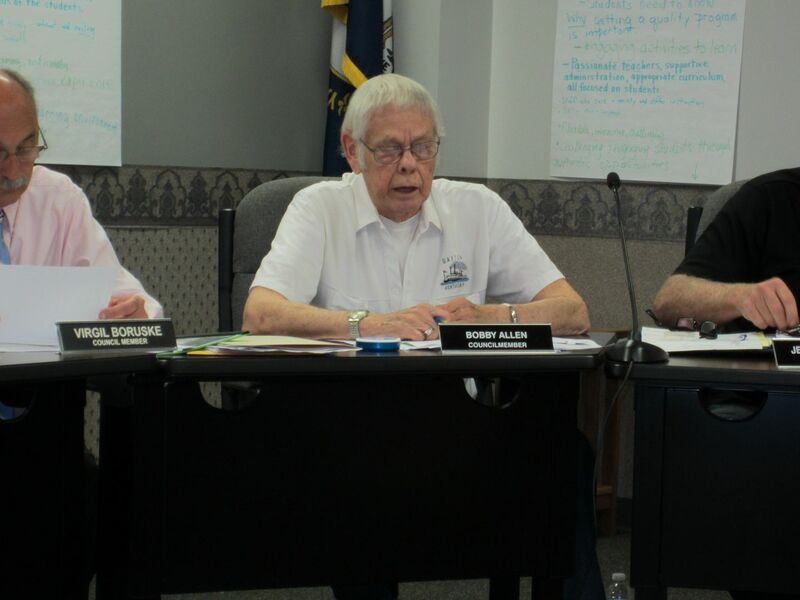 In March, council members Virgil Boruske, Bobby Allen, and Bill Burns voted to keep the meetings at the cramped city building while members Penny Hurtt, Cathy Volter, and Jerry Gifford voted to move. On Tuesday, Gifford changed his vote during the second reading of the ordinance. "You can mumble if you want to," Gifford barked at the mayor. "We should move things around until we decide what we're going to do," Gifford said. He supports moving meetings to the VFW Hall. "The VFW would be fine with me if it's OK with them." Councilman Bill Burns said he was upset that work had already been done on turning the previous council space at the city building into additional storage and offices. "The only thing I'm upset about is this. When you go to pass an ordinance, you pass it once and before you do any business," he said, "that council chamber up there has been torn apart and refurbished." "The motion passed and we cannot have the meeting here next month," Rankle said of the Board of Education building. Councilman Boruske, who is challenging Rankle in November's mayoral election, introduced a motion to move the meetings back to the city building. "You can't do that," Burns said. "It's done been torn up. You done got offices in there. My perception is, you don't even have enough room to have your voting booths in there. You got an election coming up in seventeen days and that's where you're supposed to vote at and I'm not sure you have enough room." "I think it's just a little too late to be doing this right now," Councilwoman Volter said. "What is in the best interest of the people in the community now? A meeting without a place to go? We're really arguing over things that don't need to be argued over. There are things going on in this community we should be in agreement on." The debate over meeting locations followed a lengthy discussion and presentation about various elements of the Manhattan Harbour development, the region's largest residential development project along the river that is expected to attract hundreds and maybe thousands of new residents to the city. That conversation including questions from citizens, answers from an engineer and the developer, and was mostly informative. The meeting location debate was a different story. "Why does it have to be in one place? We're not even cooperating with the schools. We still have issues with them," Gifford said. "We have a lot of issues we don't need to discuss tonight. There are people who would like to have it moved around." "Everyone can have their own opinion. You have the right to vote the way you feel and if new people get elected, they'll have their rights, but you don't always agree on everything." On whether the city council should move back to its previous home at Sixth Avenue, Burns reiterated, "It's a moot point. You've got offices up there." However, Burns then joined Boruske as the only two voting in support of moving back to the city building. Finally, Gifford made a motion to share meetings, likely between the Board of Education and the VFW, though neither was specified as definite. That motion passed 4-2 with Volter and Hurtt dissenting. "How am I going to put that in an ordinance?," asked city attorney John Fischer. "I don't know, Jack. That's your job, for God's sake," Gifford shot back. "So, somehow or another you have to construct an ordinance, Jack," Mayor Rankle said. "I can try," Fischer said. City administrator Michael Giffen was not thrilled at the prospect of using employees' time to set up meetings at different locations. "It took us a while to get down here and get it working properly," Giffen said of the microphones and electronic elements required of city meetings. "From my position, I'm not going to pull people out of the office to go move equipment. I think it would be terrible for us to have to waste a day every other month switching out the mics. I ask you to consider that." "I've got people that can set it up in less time than a day," Councilman Gifford responded. "If that's an issue, we can take care of that." At the end of Tuesday's meeting, Councilman Allen resigned. "I've been on here like twenty-five, twenty-six years. Twenty years in the police department. It's about time to hang it up," Allen said. He had been a candidate for reelection and will appear on May 20's primary ballot. "Is that official today?," attorney Fischer asked Allen after the councilman's short exit speech. Allen said he would have the city clerk prepare something formal for him to sign to signify his last day as being Tuesday night. Fischer said that was important because council only has thirty days to replace him, otherwise it becomes a decision for the governor to make. Allen recommended former fire chief Denny Lynn as his replacement. Lynn is also on the May 20 ballot where twelve will advance to compete for the six seats in November. All the other incumbents are also on the ballot. The city will accept resumes from people interested in replacing Allen. When the Bellevue-Dayton Fire Chief stepped to the podium to offer his report, Mayor Rankle said, "Welcome to the mess". Chief Mike Auteri said that regularly scheduled meetings of the Bellevue-Dayton Fire Board take place at the Callahan Center in Bellevue, opening up a parting joke from the mayor. "Would you consider having one of your meetings at the VFW so people from Dayton can attend them?" The next Dayton City Council meeting is scheduled for May 20, primary election day, at 7 p.m.